A rare fungus of hazel trees was found recently by Stuart Belshaw at Inverkirkaig. It is called Glue fungus and has only ever been recorded in Assynt four times in the past. 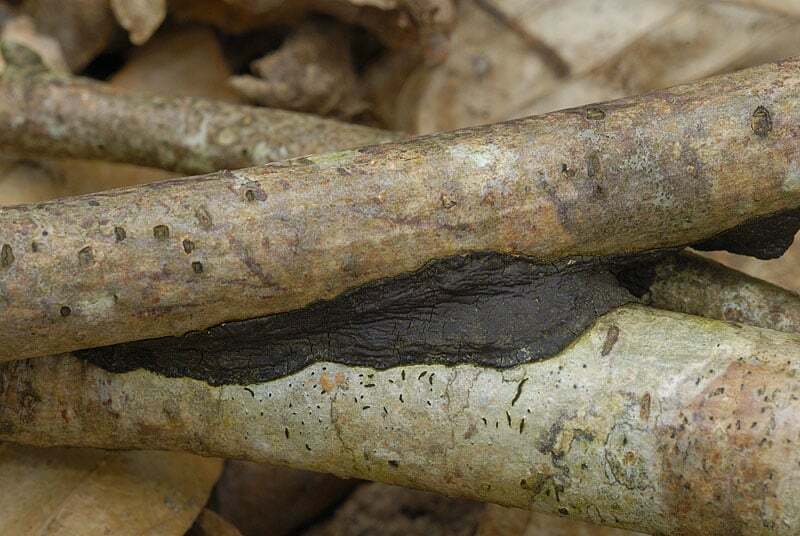 The Glue fungus, Hymenochaete corrugata, is so called because it glues dead hazel twigs to living branches in the canopy, thus preventing them from falling to the ground where they would be available to other fungi to decompose. It is quite a clever way to avoid competition with soil fungi and also other wood rotting species that function in the damper conditions at ground level. Observational evidence suggests there is a very close association between Glue fungus and the Hazel Gloves fungus. Hazel Gloves is confined to long-standing hazel woods and is a very rare species in world terms; it is a Red Data List and UKBAP priority species. The west coast of Argyll is its heartland and it has not been found as far north as Sutherland but not many folk have looked for it. Glue and Hazel Gloves fungi occur on ancient hazel trees that have not been severely cut over or coppiced at any time. The Atlantic hazel woods that occur on the west coast of Scotland are sites of world importance for fungi and lichens.